Lucky's opened two "trend-right" stores in Florida this week. 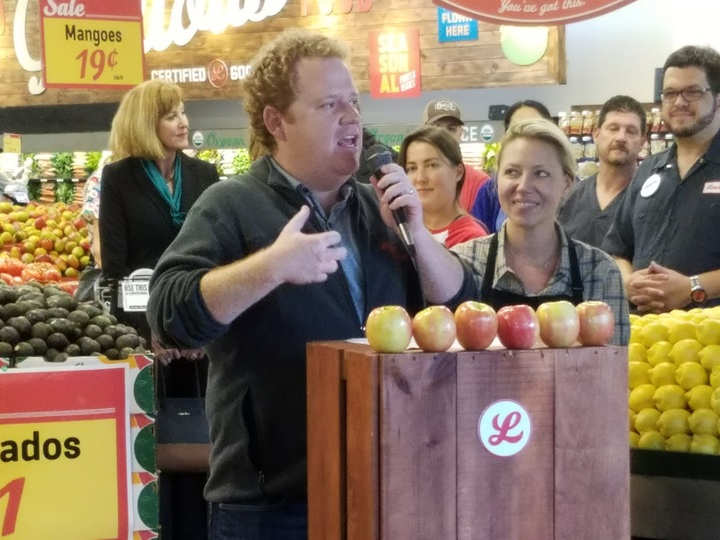 Lucky’s Market, which doubled in size this year with the opening of eight new stores and drew the attention of conventional giant Kroger, will open as many — if not more — new locations in 2017, its CEO said this week. Bo Sharon, who co-founded the Niwot, Colo.-based natural/organic retailer with his wife, Trish, in 2003, spoke at the opening of a new store in Plantation, Fla. — one of two grand opening events that day. Earlier Wednesday, Sharon had presided over opening ceremonies of a new Lucky’s in Neptune Beach, Fla.
Those new stores increased Lucky’s presence in Florida to seven locations, with at least three more — Melbourne, St. Petersburg and Sarasota — set for openings next year. Lucky’s is also opening a store in Traverse City, Mich., in 2017, with additional locations to be announced, Sharon said. Co-founders Bo and Trish Sharon attended the grand opening in Plantation, Fla. Although Lucky’s grew initially by targeting college towns across the U.S., its recent concentration in Florida is proving to be a significant strategic step: Not only is Lucky’s beating its farmers’ market-style counterpart Sprouts Farmers Market to the state — though Sprouts has several Florida sites in its near-term growth path — but Lucky’s growing presence there also was one factor helping to attract what was described as a “significant investment” from Kroger earlier this year. Cincinnati-based Kroger has no conventional stores in Florida, a market largely dominated by Publix Super Markets, which has headquarters in Lakeland, Fla.
Lucky’s unique concept — value-priced natural and organic foods served in a hip and playful atmosphere targeting foodies — was another reason Kroger took interest. At Lucky’s store in Plantation on Wednesday, shoppers familiarized themselves with a farmers’ market format that combines millennial-friendly assortments (think bacon made by bearded butchers, lots of organics and a smoothie bar) and hip messaging with the feel of a small market their parents may have grown up with, explained Ben Friedlander, a spokesman for the company. While many of the items in the store are organic and health-focused, Lucky’s at the same time encourages a bit of indulgence, featuring house-smoked bacon and deli meats, pizzas and $2 draft beers (and $3 wines) allowing for what it calls “sip-and-stroll” shopping. These offerings help to create a social atmosphere for shoppers, Sharon noted — a differentiator in a market increasingly influenced by internet shopping options. Lucky's offers "organics for the 99%" — value-priced natural and organic food. Lucky’s is able to offer sharp pricing in part by buying goods— and renting space — opportunistically. The Plantation store for example was a former Whole Foods site left available when the organic giant relocated to a busier corner nearby two years ago. Lucky’s street visibility isn’t ideal, but the rent was right and the neighborhood, judging by its retail neighbors, is desirable. A six-year-old Publix with much better street visibility and full range of its service features is on an opposite corner. Lucky’s officials noted Wednesday that some of the employees — and many of the shoppers — were making return appearances at the store and were energized by what they described as a more affordable and accessible take on many of the things the previous tenant did well. 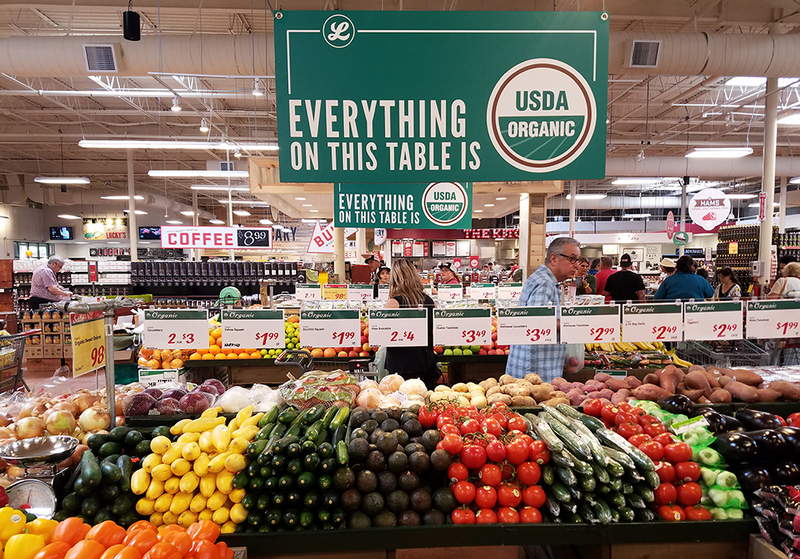 But where Whole Foods tended to position its quality offering as aspirational, Lucky’s promotes “organics for the 99%,” including a large range of house brands at sharp prices. Sharon declined to provide details of how Lucky’s was performing as a business, but said new stores were exceeding expectations and that he was pleased with the same-store performance of its mature units this year. “The pipeline for next year is a great reflection of how well we did this year,” he said.